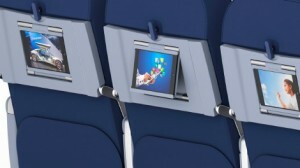 Clear Channel Airports Inc., Allentown, Pennsylvania, has partnered with SmartTray International LLC, Phoenix, Arizona, to transform decades-old airline seat-back food trays into multi-purpose tech friendly tray-tables capable of simultaneously accommodating both mobile devices and the typical in-flight pretzels and beverages. This innovation is capable of leveraging digital place-based media technology while bringing passengers in-flight entertainment and Internet access right to their fingertips without their ever having to reach overhead for their stowed tablet or other mobile device. This partnership comes on the heels of the Federal Aviation Administration’s Oct./13 ruling that “…airlines can safely expand passenger use of Portable Electronic Devices during all phases of flight…” As a result, it’s anticipated that airline passengers will soon be reading e-books, playing games and watching videos on their own mobile devices during most phases of flight. 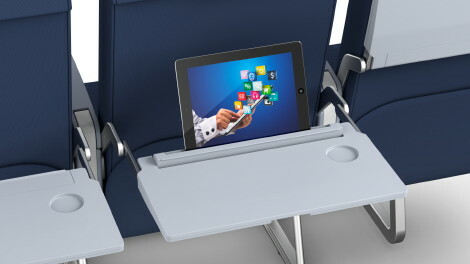 Smart Tray fashioned three different aircraft tray designs to support the use of Portable Electronic Devices – travelers’ own devices and/or those provided by an airline. The SmartTray X1 features a fixed or rotating groove for a PED device. The X2 is a ‘tray within a tray’ and accommodates a PED by stowing the tablet inside the tray table while leaving the device fully accessible when the tray table is in the upright or down positions. 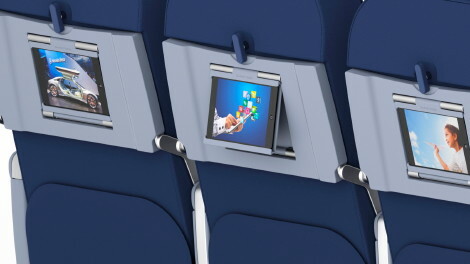 The X3 is electronic and designed for embedding airline-owned tablet devices into the tray table and eliminates the time consuming and costly logistics of distribution, collection and re-charging of tablet device batteries inside airports between flights. With the X2 and X3 models, Smart Tray becomes the launching pad for flexible and targeted marketing in the digital arena, reaching consumers when they have the time and the mindset to buy the products and services being presented to them in flight. CCAirports will help airline clients monetize their investments in SmartTray with advertising sales support and activation that adheres to recent FAA guidelines. With this new digital place-based media in CCA’s portfolio, the company can help advertisers with highly-targeted marketing approaches that reach travelers when they are receptive to brand messaging. Consumer insights from in-flight users paired with other data such as the travelers’ frequent flier numbers, hotels and car preferences can potentially add to advertisers’ campaign capabilities and understanding for ROI. CCAirports and SmartTray will deliver performance-based analytics. For existing aircraft, installing SmartTray X1, X2 or X3 is faster and more economical than a complete seat replacement or retrofit. 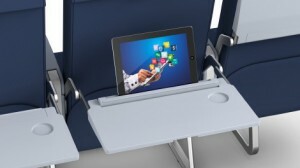 Attached with one or two screws, the SmartTray table holds portable electronic devices safely in-flight. An entire aircraft can be retrofitted overnight, in a single service, resulting in no aircraft downtime. This entry was posted on Wednesday, January 22nd, 2014 at 09:59 @457 and is filed under DailyDOOH Update. You can follow any responses to this entry through the RSS 2.0 feed. You can leave a response, or trackback from your own site.